01. For the dough, put the flours, salt and sugar into a large bowl and stir. Mix the yeast with a little of the water in a jug to form a paste, then add the rest of the water to the jug so the yeast dissolves. 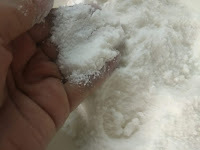 Make a well in the centre of the flour and pour in the yeasted water, gradually mixing to form a soft dough. Tip out and knead on a lightly floured work surface until smooth and elastic. 02. Divide into 4 even pieces and roll into balls, then put on a tray, cover and leave to rise for 1 hour or until doubled in size. 03. Meanwhile, for the topping, heat a sauté pan, add the oil, shallot, garlic and spices, then fry for 2 minutes. Add the lamb and cook over a high heat, turning often and breaking up with a wooden spoon, until browned all over. 04. Add the sultanas and chicken stock and bring to the boil, then reduce the heat and simmer for 20 minutes or until the mince is tender and the stock has nearly all evaporated. Taste and season with salt and pepper, then leave to cool. 05. Heat the panggangan to as high as it will go. Put a heavy baking tray or pizza stone in the panggangan to heat up. 06. Roll each piece of dough out on a lightly floured surface into an oval or oblong about 20cm x 15cm, and about 5mm thick, then put onto an upturned floured baking tray. Cover the bases with the lamb mixture, then evenly scatter with the yogurt and chillies and some seasoning. 07. Slide the flatbreads onto the hottray or stone (you may have to cook in batches). Bake for 5-10 minutes until golden and crisp. Scatter with the herbs and serve immediately. This is a great pizza base recipe that you can top with whatever you want. Baharat is a Middle Eastern spice mix, typically made with cumin, cinnamon, coriander, paprika, cayenne, black pepper, nutmeg and cardamom. Find it in larger supermarkets, or make your own by combining the spices to your own taste.